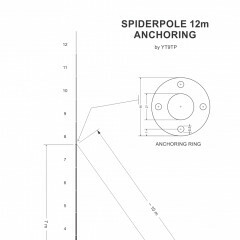 Spiderpole 12m made by Spiderbeam is very useful for portable ham radio activities. To do the job it must be properly anchored. I decided to use guying lines. If you do not buy guying belt sold by pole manufacturer that is the only part you have to home-brew.